Here’s who trained Gurmeet Choudhary for J P Dutta’s PALTAN! 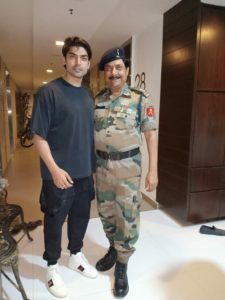 Gurmeet Choudhary is eagerly anticipating the release of J P Dutta’s highly anticipated war drama, PALTAN. Interestingly, the film is quite special to him, not just because he got the opportunity to work with the veteran filmmaker for the first time but also the fact that he got trained by his father, Major Sitaram Choudhary for his character of an Army officer in the movie. It’s learnt that the actor even underwent a 15-day prep with him for the part. “My father has served the Army for years and imparted training to new recruits. So, who better than him could train for my character in Paltan? It was a challenging, yet learning experience to train under him for before kick-starting the movie,” informs Gurmeet. “Dad taught me rope climbing and military low-crawling. He also helped me adopt the ramrod straight posture required while holding guns,” he adds.